From a motorist’s perspective, few things are more frustrating than sitting at a red light when the lights ahead are all green. That would help explain the popularity of traffic signal synchronization, neatly timing lights so that someone traveling the speed limit can expect to wait only every several cycles. Many communities have seized on synchronization as a relatively inexpensive way to reduce congestion and emissions. In fact, it’s one of the approved uses for Congestion Mitgation and Air Quality money from the federal government. Traffic engineering has long been full of promises on solving road congestion, with many solutions worse than the problem. 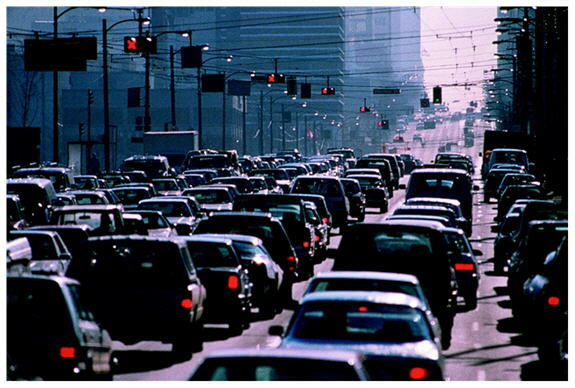 When roads have been widened or new roads built, induced demand has been the result. If we make all of our signals “smart” and easy for people to drive in the city, what happens then? We’ll see a mode shift away from alternative transportation options as people discover that synchronized traffic signals make driving easier, thus increasing demand for driving. Making driving easier brings all the negative externalities to the fore: increased auto emissions, gas consumption and pressure on land uses to accommodate cars. Thus, while traffic signal synchronization seems like a good idea, the unintended consequences are likely to make the existing traffic congestion status quo even worse. Where I live in Cleveland, traffic signals have never been coordinated (or thinned out as the population has shrunk), and the headache of driving is one of the major reasons I started biking. Too bad our metropolitan planning organization still spends the bulk of its CMAQ money on traffic signal synchronization and not on bike lanes. Elsewhere on the Network today: Reinventing Parking explains why American parking policies are like vanilla ice cream, European parking policies are like dark chocolate, and Japanese regs are like a sushi bar. Cap’n Transit says that evicting everyday activity from the street — like child’s play — has contributed to chaos on the sidewalks. And Cycling Solution says that bus lanes are now open to cyclists in Budapest. A petition in Seattle is calling on the city to do away with "beg buttons" and automatically give pedestrians a walk signal at every traffic light in its "urban villages" -- areas that are walkable and transit-oriented. While pressing a button may seem like a small imposition, it's not that simple. Researchers have released new findings that suggest a more consistent traffic-reduction impact than previously thought.